Labour has held on to the Newport West parliamentary seat with a reduced majority following a by-election. Union official Ruth Jones won the south Wales seat, which fell vacant with the death of veteran Labour MP Paul Flynn in February. Labour saw its majority over the Conservatives fall to 1,951 from 5,658 at the 2017 general election. Mr Flynn had held the seat since 1987. Eleven candidates stood, with the 37% turnout higher than some had predicted. In her victory speech, Ms Jones, 56, said the by-election had taken place because of "the sad passing of Paul Flynn, our friend". "There have been many tributes to him over the weeks but one saying stood out to me - 'everyone knew somebody who was helped by Paul Flynn'," she said. "These words have been an inspiration to me throughout the campaign. That's what we're here for - to do our best to help others." She added: "Now that you've elected me to go to Parliament, I will do what I promise to do on the doorstep: I will stand up for the people, the jobs and the economy of Newport West." Born and brought up in the constituency, Ms Jones, a NHS physiotherapist, has been a full-time union official with the Chartered Society of Physiotherapy since 2016. She stood as the Labour candidate in Monmouth at the 2015 and 2017 general elections. "Who knows what the next few days, weeks and months will bring," she added. "But what I do know is that people have had enough after a decade of austerity." The result saw a swing from Labour to the Conservative of 2.4%. Labour leader Jeremy Corbyn said Ms Jones would be a "fantastic successor to Paul Flynn and will take up the tireless work he carried out for this community". "Tonight's result sends a clear message that the people of Newport and Wales are fed up of austerity which has robbed the Welsh economy of £1bn through needless cuts and shows support for Labour's alternative," he added. Conservative candidate Matthew Evans said he had "never seen such anger and frustration" on the doorstep as what he encountered over Brexit. "People just want clarity and I've seen no appetite for another referendum or a general election," he said. UKIP candidate Neil Hamilton, an AM for the party, came third with 2,023 votes. He campaigned saying the by-election was a chance to send a message to Westminster over its handling of the UK's departure from the EU. He said: "To nearly quadruple our vote, I regard a success in itself even though we didn't win the election. "I regard this as the start of a new era for my party and I look forward to the next election, whenever that may come." This is a good hold for Labour and Ruth Jones will be pleased to be heading for Westminster with a majority of nearly 2,000 at a time of such an unpredictability. The Conservatives will be pleased to have held off the UKIP challenge for second place when the UK government is under such pressure over Brexit. But UKIP is taking encouragement from a vote share of more than 8%, which would be their baseline for keeping a presence in the Senedd at the next Welsh Assembly elections. What happened in this by-election should not be taken as a barometer for for future elections - politics is a rollercoaster right now. Ruth Jones will need to fasten her seat belt. 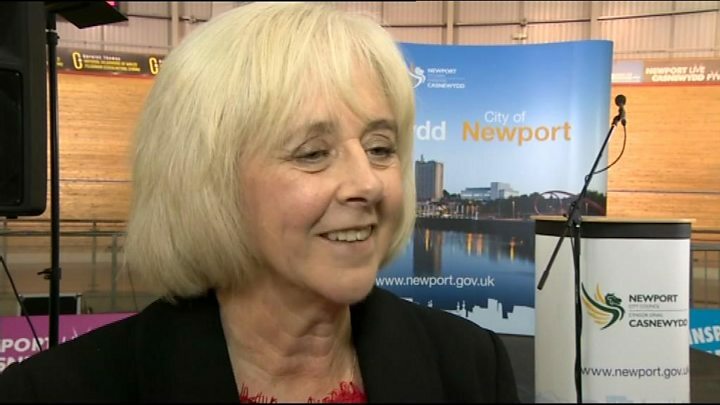 Newport West by-election: Who are the candidates?